Hōryū Gakumonji (法隆学問寺), or Learning Temple of the Flourishing Law, the complex serving as seminary and monastery both. The temple's pagoda is widely acknowledged to be one of the oldest wooden buildings existing in the world, underscoring Hōryū-ji's place as one of the most celebrated temples in Japan. In 1993, Hōryū-ji was inscribed together with Hokki-ji as a UNESCO World Heritage Site under the name Buddhist Monuments in the Hōryū-ji Area. The Japanese government lists several of its structures, sculptures and artifacts as National Treasures. The temple was originally commissioned by Prince Shōtoku; at the time it was called Ikaruga-dera (斑鳩寺), a name that is still sometimes used. This first temple is believed to have been completed by 607. Hōryū-ji was dedicated to Yakushi Nyorai, the Buddha of healing.
. Stamps with this haiku . The Kudara Kannon is a statue of Kannon and made of gilded camphor wood. The word "Kudara" in Japanese stands for the Korean kingdom of Baekje (Paekche). 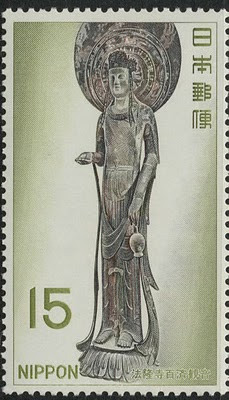 This Kannon is a statue that supposedly is the representation of Prince Shotoku. It is approximate six feet and one inch and some sources believe that Shotoku was that height. It is 197 centimeters in height. The kannon is made of gilded wood. It is suggested that the statue was made to assuage the dead prince's spirit based on the fact that the halo was attached to the statue by a nail driven through the head. This collection also contains haiku about other temples.
. kazakirigama 風切鎌 (かざきりがま) "wind-cutting sickle"
The oldest completely preserved temple complex in Japan, the Horyuji Temple, is a magnificent example of the architecture of the Asuka period (552-645) with masterly works of art covering the whole range of Japanese history. Yomei-tenno, the first Buddhist Emperor of Japan, was overtaken in 586 by a serious illness and ordered a statue of the Healing Buddha (Yakushi-Nyorai) to be made, but died before it was completed. In order to fulfil his wish Shotoku-taishi, the Emperor's son, caused the Horyuji Temple to be built in 607. As one of the "Seven Great Temples of Nara" this became the great center of Buddhism in Japan, from which the new faith was carried to all parts of the country. In those days the road from the Imperial Court to the coast passed the site of the temple. The Horyuji, principal temple of the Shotoku sect, comprises 45 buildings, erected between the Asuka and Momoyama periods, 17 of which are classified as "major national treasures". The temple complex is divided into two parts - the To-in or Higashi-no-in (the eastern part), with 14 buildings, and the Sai-in or Nishi-no-in (the western part), with 31 buildings.